θriː tʃɪəz fə ði en eɪtʃ es. ɪts ət taɪmz laɪk ðɪs ðət ju rɪəlaɪz haʊ lʌki wi ɑːr ɪn ðə juː keɪ tə hæv ɪt. ɪn sʌm ʌðə kʌntriz aɪ wʊd bi tʃɑːdʒd fər evri skæn, evri test, evri drɪp, evri kæθɪtər, evri ɪntəvenʃn. hɪə ðər ə nəʊ tʃɑːdʒɪz, evriθɪŋ ɪz friː ət ðə pɔɪnt əv juːs. aɪ əm hæpi tə peɪ maɪ tæksɪz ɪn ɪkstʃeɪndʒ fə ðɪs piːs əv maɪnd. ɒn wenzdi mɔːnɪŋ lɑːs wiːk aɪ drəʊv maɪ pɑːtnə tə ɡætwɪk eəpɔːt. hiː wəz ɒf tə mɒntsəræt fə hɪz ʌŋklz hʌndrədθ bɜːθdeɪ selɪbreɪʃnz. ɪn ði iːvnɪŋ aɪ hæd dɪnə wɪð frenz ət ə restərɒnt ɪn krɔɪdn. æz aɪ went tə kætʃ ðə træm həʊm aɪ faʊnd ðət maɪ left hænd dɪdnt siːm tə bi wɜːkɪŋ prɒpli, ən ðen maɪ left leɡ kəlæpst ʌndə mi ən aɪ fel daʊn. pɑːsəzbaɪ keɪm tə maɪ help ən kɔːld ən æmbjʊləns, wɪtʃ tʊk mi tu eɪ ən iː (æksɪdnt ən ɪmɜːdʒənsi) ət sn dʒɔːdʒɪz hɒspɪtl tuːtɪŋ. θæŋks tu ɔːl ðə frendz kɒliːɡz ən fæmli hu əv vɪzɪtɪd mi ɪn hɒspɪtl. aɪ həv naʊ biːn muːvd tə snt heliə hɒspɪtl ɪn sʌtn. Blog postings will be sporadic until I recover. A member of the public wrote to the Spelling Society, of which I am President. I have recently taken issue with the BBC for concluding that it is now 'acceptable' for H to be pronounced Haitch. This appears to be on the guidance of Professor John Wells and on the basis that it is commonly used. 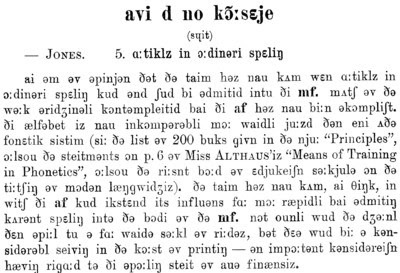 Samuel Johnson's first dictionary ascribed spellings to all letters of the alphabet, including AITCH for H.
I would be interested to hear therefore why you seem to be perpetrating this peculiar distortion as opposed to upholding the correct pronunciation. I intially took up this issue after writing to Heart Radio about one of its presenters using “Haitch” and was told that this was because the BBC said it was an “attested legitimate variant”. The BBC in reply led me to Professor Wells and thus your organisation. It may be ‘popular’ but it is still wrong. My ambition is merely for institutions such as the BBC, and indeed yourselves, to hold the line on this letter, and advise against this awful and ignorant pronunciation which is now spreading. I demurred at the apparent misrepresentation of what I had contributed to the debate. I have never given any such “guidance”. I have never recommended “haitch” as the name of the letter. What I did do was carry out a survey into people’s preferences in the UK, which revealed that only 16% of respondents prefer “haitch” over “aitch”, while 84% prefer “aitch” (like you, me, and the Chair of the Spelling Society). 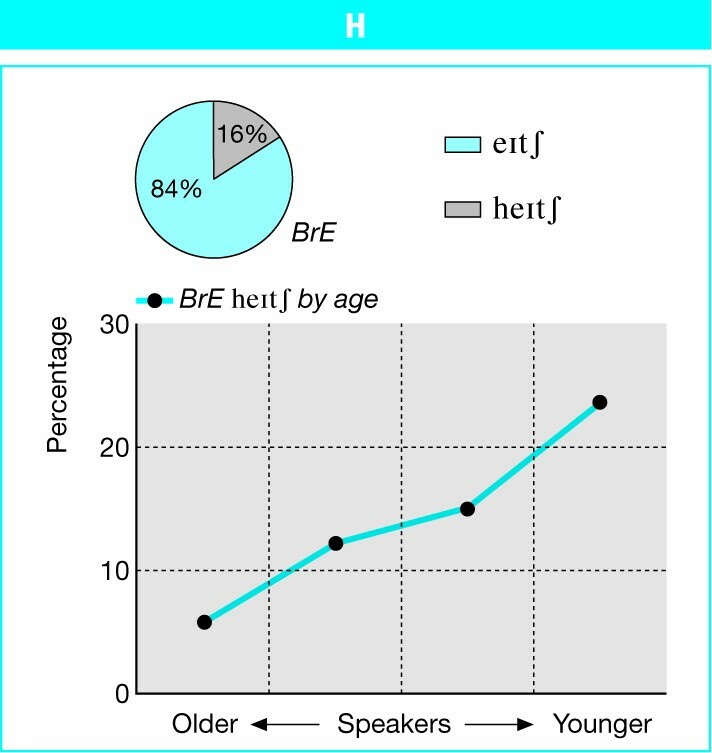 However, younger speakers are more likely than older speakers to prefer “haitch”, so this pronunciation is on the increase. The details are to be found in my Longman Pronunciation Dictionary (Pearson Education, 2008). You might like to read two or three entries in my blog: for 19 Dec 2007 and 28 Dec 2007 and for 2 Nov 2010, with the comments left on the latter. Please do not spread false reports about what I supposedly said. With hindsight, my reply was perhaps too prickly. But it seemed to me that the lady who had written the letter wanted to shoot the messenger because she did not like the message. My pronunciation preference poll had revealed that a minority of British people — a growing minority, but still a minority — prefer to name the letter heɪtʃ, and therefore may (if they think about the matter at all) consider this to be the correct name, and the traditional eɪtʃ to be antiquated, slovenly, or indeed wrong. In LPD I included a note. The form heɪtʃ is standard in Irish English, but traditionally not in BrE or AmE. It is, however, spreading in BrE. You could indeed argue that on the basis of these polling figures I was wrong in LPD to affix the sign § (“non-RP”) to the heɪtʃ form. In doing so, though, I gave the lie to the Telegraph’s jibe that I ‘breathed no word of criticism of those who did [use a minority-preference variant]’. But no. I can have my preferences and prejudices as much as anyone else. From time to time they no doubt show through in what I write. But I am enough of a scientist to have respect for the facts, and to wish to investigate to the best of my ability what the facts are. And the fact is that, despite any feelings I may have on the matter, despite the dislike, nay loathing, that other people may feel towards new pronunciations of particular words or towards sound changes in general, there is little any of us can do about it. In an EFL context, it is perfectly reasonable for learners to look to me (and other academic linguists) for advice on what is the correct pronunciation for them to use. In the same way I have never hesitated, as a language learner, to ask speakers of German ‘Wie sagt man das? Was ist die Aussprache?’, or a speaker of Welsh ‘Ydw i’n ynganu hynny’n iawn?’ when confronted with a written word that I am not sure about. In an acting context, it is perfectly reasonable for drama students and actors to seek the facts about how a given character would be likely to speak. In a speech-and-language-therapy context, it was always part of my professional duties to educate SLT students about the facts of ordinary English pronunciation and to combat some of the myths. But it’s not my duty, as an academic linguist, to lay down the law about how people should pronounce their own native language. Yes, if some actor in a historical drama were to put the pronunciation heɪtʃ in the mouth of an upper-class character, we can point out that it would be an anachronism (like the initial-stressed contribute heard from a titled character in Downton Abbey on television recently). Yes, we can complain if presenters of classical music lack the knowledge to make a reasonable attempt at Italian or German names. The BBC rightly requires of its newsreaders great carefulness in the pronunciation of proper names, including those from other languages, and maintains a Pronunciation Unit to advise them by supplying relevant information. We just have to get over it. I shall be busy with other matters tomorrow. Next posting: 21 June. Who better than you to consult about my life-long puzzlement over the pronunciation of Ulysses. I've always stressed the second syllable, I’m not sure why, but initial stress seems to be the norm. What are the rights and wrongs of this, from a classicist’s point of view? With last Saturday being Bloomsday, the airwaves were full of discussions of James Joyce’s novel Ulysses. And everyone I heard on BBC Radio Four called it ˈjuːlɪsiːz. Not me. I’ve always called it juˈlɪsiːz, like the eponymous hero of the Odyssey, Greek Odysseus əˈdɪsjuːs and Latin Ulysses or (less usually) Ulixes (apparently via Sicilian Greek Οὐλίξης). In accordance with the Latin stress rule (stress the penultimate if it is a heavy syllable), all three forms of the name are traditionally stressed on the penultimate. The double s of Odysseus and Ulysses, like the x of Ulixes, makes the syllable heavy. By the 14th edition (ed. Gimson and Ramsaran, 1977) the word ‘rarely’ has been removed, but priority is still given to juˈlɪsiːz. It was only when Peter Roach took over as editor that the priority was changed, placing the antepenultimate-stressed version first. Judging by what I heard on the radio, Peter was right to make this change. Perhaps I ought to do the same for LPD. Or at least conduct a preference poll. The Merriam-Webster Collegiate and other dictionaries suggest that Americans still retain the traditional penultimate stressing. Perhaps it’s only the Brits (and only some of them) who have abandoned it. The influence of my schooldays in the Classical Sixth is still strong. I don’t think I’m going to change my own pronunciation. A hundred years ago the IPA was debating whether to admit articles in ordinary spelling to its journal the mf (Le Maître Phonétique). Daniel Jones thought it might be a good idea. From one such Supplement published in the same year, 1912, here is a ‘specimen of phonetic [hand]writing’: the North Wind and the Sun in ‘Northern English’, presumably therefore contributed by R.J. Lloyd. His accent was rhotic, with monophthongal FACE eː and GOAT oː. What happens when you want to italicize the ash symbol, æ? Here’s what it looks like in two fonts I often use, Cambria and Segoe UI. In the first, on the left, it retains the usual shape, but in the second it looks like a combination of ɑ and e rather than a and e. This makes it easy to confuse with an italic œ, namely œ. I certainly prefer the first, Cambria, type, which is why I was a bit surprised at Michael Everson’s version of this italic letter (blog, yesterday). 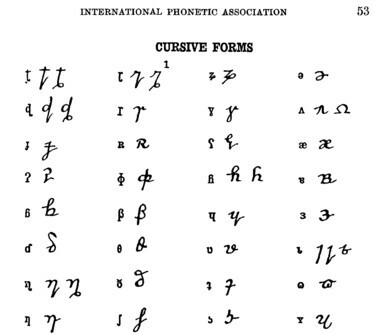 In the 1949 Principles of the IPA there was a special page devoted to cursive forms of the symbols. Back in those days joined-up handwriting was much more general than it is now, and people no doubt needed to know how to write the IPA characters with pen and ink in a way that enabled them to be joined (where appropriate) to the characters on either side. 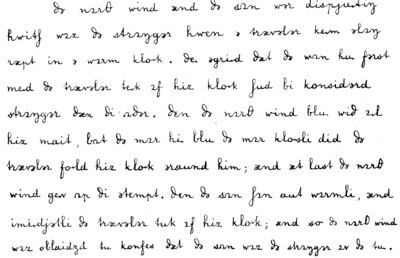 Note the careful attention to making a clear difference between cursive æ and cursive œ.
Jones himself used these cursive forms when making notes, and I suspect that it was he who handwrote the characters you see here. So did Hélène Coustenoble, who taught me French phonetics. But none of his successor generation (Gimson, O’Connor, Arnold, Pring, Trim) at UCL used these cursive forms; nor does anyone alive today (as far as I know). Without this key I think it might be difficult to recognize the cursive forms shown for ʎ ɹ ç ʕ ø ɐ ɩ and ʏ, not to mention the shape suggested for the length mark ː. The cursive form of ɲ, which I have indeed encountered, can easily be mistaken for some people’s handwritten p.
Perhaps it’s just as well that nowadays we write the symbols as block (lower-case) letters — or use a keyboard. 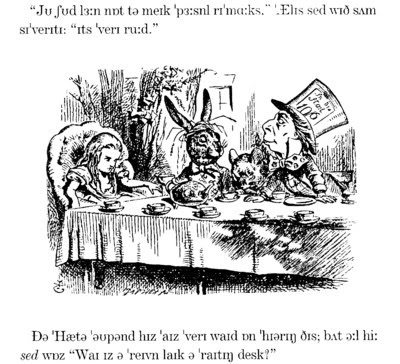 Michael Everson has created an IPA edition of Lewis Carroll’s Alice in Wonderland and has kindly let me see a copy. I may have some comments to make on the transcription of particular words and phrases once I have finished reading it. Meanwhile, I thought I would comment straightaway on one striking visual characteristic of the transcription in general, namely Everson’s decision to use not only punctuation and italicization but also capitalization — and capitalization not just for proper names but also, as in ordinary English spelling, to mark the beginning of a sentence and even for the pronoun I. 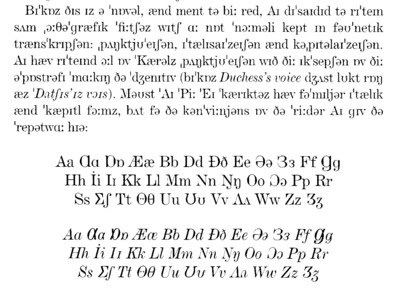 In the days when the Journal of the IPA was called Le Maître Phonétique and written entirely in transcription, the rule was very clear: phonetic symbols are always lower-case. To indicate that a word was a proper name, the orthographic capitalization was sometimes replaced by a preposed asterisk, a usage specified in the old Principles of the IPA booklet (1949). On the other hand the same booklet concludes with a brief note on Phonetic Spelling, which does use capitalization not only for proper names but also to mark the beginning of a sentence. 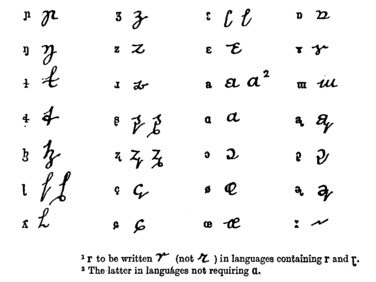 The decision to distinguish upper and lower case means that Everson also had to decide on a suitable upper-case shape for each IPA symbol required in the transcription. Since he is a typographer and font designer, this was right up his street. Here are his solutions. As we all know, English words spelt with u that come from Latin, or from Greek via Latin, regularly have a palatal semivowel in English. Thus Latin futur-us gives us BrE ˈfjuːtʃə, AmE ˈfjuːtʃɚ, while Latin fūtĭl-is gives us BrE ˈfjuːtaɪl, AmE ˈfjuːt̬l̩. Greek μουσικ-ή mousik-ē ends up as English music, pronounced ˈmjuːzɪk. After alveolars the j was lost, or subject to coalescence, depending on the variety of English involved, giving the familiar variability in words such as tube tjuːb ~ tuːb ~ tʃuːb. In East Anglia the yod has been lost more widely, even in words such as music, human (and of course beautiful — here’s the locus classicus). There’s some variability in weak syllables, too, as when ambulance, executive or regular are pronounced without j in certain non-standard accents. Disregarding these categories of exceptions, though, the rule applies pretty widely, and not only to Greco-Roman borrowings, but also to other long-established ‘international’ words (butane, Cuba, pupa). In more recent loans there may be more variability. So on the one hand Rudolf Nureyev (Russian/Tatar Нуреев, Нуриев nu-) often has nj- in BrE, while the late Sir Peter Ustinov (Russian Устинов uˈstʲinəf) was happy for his name to be anglicized as ˈjuːstɪnɒf; but on the other there is variability in Lithuania, Nicaragua, jaguar and muesli. However Zulu is firmly yodless, and Japanese futon ɸɯ̥toɴ becomes English ˈfuːtɒn, never ˈfjuː-. When it comes to acronyms (initialisms) we again see variability. When I was a student the University of London Union, ULU, was generally known as ˈjuːluː (and I think still is). We had BUNAC ˈbjuːnæk (the British Universities North America Club) to enable us to buy cheap flights to the USA, while CICCU ˈkɪkjuː (the Cambridge Inter-Collegiate Christian Union) tried to save our souls. I believe CUNY (the City University of New York) is known as ˈkjuːni. But the British medical insurance company BUPA (British United Provident Association) is ˈbuːpə, and the GUI (graphical user interface) by which you operate your computer is a ˈɡuːi. The severe flooding in mid-Wales over the weekend again provided something of a pronunciation problem for newsreaders on British radio and TV. The names of the villages Dôl-y-Bont (‘meadow of the bridge’) and Tal-y-Bont (‘end of the bridge’) had local reporters pronouncing the embedded Welsh definite article -y- in the Welsh way as ə, while less well-informed outsiders gave it an English spelling pronunciation i. Another of the villages badly affected was Pennal, near Machynlleth. 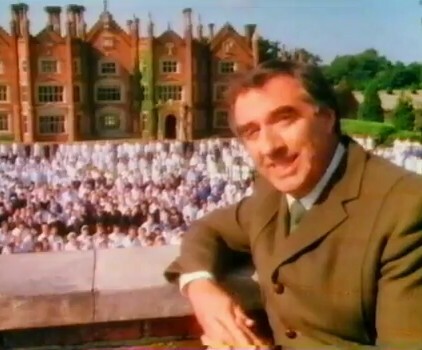 In an ITV report from there I was struck by the reporter’s pronouncing it as peˈnæl, with final stress. (There was also an English visitor who pronounced it in the expected English spelling-pronunciation way, as ˈpenl̩.) On consulting the BBC Pronouncing Dictionary of British Names (OUP 1990) I find that the form recommended there is ˈpenæl, i.e. with initial stress but unreduced second vowel. In this news clip from the BBC you can hear both stress patterns for penæl (or pɛnal, if you prefer). The etymology is pen ‘head’ plus hâl, where the second element might mean either ‘moor’ or ‘salt’. (“Despite now being a half mile from the estuary of Afon Dyfi, high tides did reach Afon Pennal … and Roman ships are believed to have had trade access up Afon Dyfi south of Pennal village” — Owen & Morgan, Dict. of the Place-Names of Wales, 2007). Pennal is known for its historical association with Owain Glyndŵr. In Pennal Owain composed the famous Pennal Letter of 1406, a letter to the King of France setting out his plans for an independent Wales - the only document which stands as a policy document for an independent Wales in the Middle Ages. The letter was briefly returned to Wales from France for an exhibition at the National Library of Wales in 2000. Some of you may know Geoff Lindsey’s excellent blog Speech Talk. You may not be aware that Geoff also runs occasional five-day workshop courses on Contemporary English Pronunciation at UCL. The next one starts in a week’s time on 18 June, and he tells me that places are still available. I’m happy to recommend it. How do we accent the absence of something? a zero morpheme, if you will? When we use contrastive focus, we do it by nuclear-accenting the contrasted item(s). It wasn’t blue, | it was green. They weren’t wicked, | they were just badly behaved. I don’t want to interrogate you, | I’d just like to have a brief word or two with you. Was it your arm that got bitten? —No, it was my leg! This may involve deaccenting a repeated item. It wasn’t any old shade of green, | it was pea-green. Not only did I injure my hand, | it was my right hand. Sometimes the contrastive element is not a complete word. We can place the nuclear accent on a contrastive morpheme. It wasn’t lunchtime, | it was teatime. But what if that morpheme is not lexically stressed? Can we still place a nuclear accent on it? Yes, we can. I didn't ask for a teapot, | I asked for a teacup. It wasn’t really blue, | just bluish. How do we treat cases like these? I don’t think we really have any hard and fast rules about this. The speaker has to weigh up, as he goes along, the pressure to avoid accenting a repeated item and the contrary pressure not to accent a normally unstressed syllable. Worse still, how can we accent the absence of a morpheme? Instead of harping on about unemployment, why doesn’t he congratulate the Government on the increase in employment? (Unfortunately, I can’t find a video clip of this.) He duly put the first nuclear accent on un-, but was then faced with the problem of how to accent the antonym. And what he did was to shift the last nuclear accent not onto zero (the absence of un-), where it logically belonged, but onto the nearest available syllable. … about unemployment, | … increase in employment? 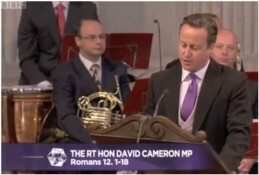 And, interestingly, he didn’t strengthen the vowel but kept it as weak ɪ. It seemed like a good idea at the time, but it clearly confuses a lot of people. Like many other phoneticians of English, for the past twenty-odd years I have been using the symbol i to represent the weak ‘happY’ vowel used in positions where the FLEECE-KIT distinction, iː vs. ɪ, is neutralized, and where an older generation of RP speakers used a lax [ɪ] but a younger generation tend to prefer a tense [i]. Is there any rule for the use of i and u (neither long nor short? In the case of bizarre we use ɪ and for behind i. What is the difference? My reply went along the following lines. The symbol i does not mean “neither long nor short”. It means that RP traditionally has lax ɪ in these positions, but that many speakers nowadays use a tense vowel like iː. Therefore the EFL learner may use one or the other indifferently in these cases, because it does not make any difference whether the vowel is tense or lax. See further the discussion in LPD under "Neutralization" (p. 539 in the third edition). (c) in the unstressed prefixes be-, de-, pre-, re- and certain word-like combining forms such as poly-. As far as I know, no one uses a tense vowel in bizarre, whereas in behind and other be- words some people do. If all this is too complicated to teach, tell people that they should interpret i (without length marks) as meaning the same as ɪ (the KIT vowel). That might make them sound a bit old-fashioned (like me), but nothing worse. I might have gone on, but didn’t, to discuss the theoretical idea that English has a weak vowel system as well as a strong vowel system; the weak vowels are found exclusively in unstressed positions, and are those vowels which can result from vowel weakening in the lexicon. Pairs such as vary, variety demonstrate that i acts as the weak counterpart of aɪ. The strong and weak forms of me, she etc demonstrate that it also acts as the weak counterpart of iː. All the above applies, mutatis mutandis, to u (“sitUation”). Perhaps this is another case of the conflict between on the one hand trying to accurately document the phonetics and phonology of English and on the other hand presenting a convenient simplified distillation for pedagogical EFL purposes. 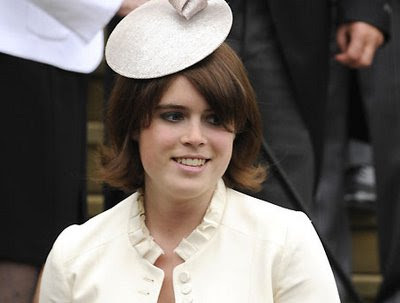 Among the minor royals to be seen at the jubilee celebrations over the weekend was Princess Eugenie. She is the younger daughter of Prince Andrew, Duke of York; her mother is Sarah Ferguson and she is the Queen’s granddaughter. I was struck by the fact that the ITV commentator pronounced her name as ˈjuːʒəni. On consulting Wikipedia I find that that pronunciation is given there as appropriate, with a supporting citation from a television documentary now no longer retrievable from the website mentioned. I wonder if this is indeed how she says her name. If so, it is worthy of comment. The only bearer of the name Eugenie that I know or knew personally was the late Professor Eugénie Henderson (1914-1989), Professor of Phonetics in the University of London at SOAS. She was a former pupil of Daniel Jones and an expert on Thai, Karen, Chin and other southeast Asian languages as well as an inspired theoretical phonetician/phonologist. I knew her as a cheerful, hard-working and helpful older colleague. BAAP awards a biennial Eugénie Henderson prize. She pronounced her name as juˈʒeɪni, and so did we all. She also spelt it with a French acute accent on the vowel in the middle. Ever since Jones’s day EPD has prioritized ju:ˈʒeɪni, though also giving juːˈʒiːni and juːˈdʒiːni. The ODP gives BrE juːˈʒeɪni, AmE juˌʒeɪˈni (the ODP doesn’t use length marks for AmE). Forvo, too, gives the pronunciation juˈʒeɪni. The Merriam-Webster Collegiate gives three possibilities, which in IPA would be ˈjuːdʒəˌniː, juːˈdʒeɪni, juːˈdʒiːni. So our pronunciation authorities give no support whatever to the form ˈjuːʒəni. If that is indeed what Andy and Sarah call her and what she calls herself, it’s an innovation. As Professor Henderson’s spelling hints, the name is of French origin (and before that, of course, from Greek via Latin: Εὐγενία Eugenia ‘well-born’). In French it is pronounced øʒeni. So ju(ː)- is English rather than French, following words such as eugenics, euphoric, euphemism. I was wondering whether you could tell me something about the recordings on the CD-ROM [that accompanies the printed LPD]: who are the people whose voice you recorded, [what was] their age, [and what was their] profession. This will probably help me understand the occasional mismatch between first transcription and recording. In reply I must first confess that not all the voice clips were recorded especially for LPD. Some came from the Longman database and had originally been recorded for LDOCE or other Pearson Education dictionaries. Nevertheless, we did record something close on a hundred thousand sound clips specially for LPD. I spent 25 full working days in the studio monitoring them as the speakers spoke them, and to the best of my knowledge they are all accurate and correct. But I did not have a chance to monitor the remainder, nor to check whether they agreed with my choice of first pronunciation. For those mismatches that have been brought to my attention, I will try to ensure that for the next edition (whenever that is) we sort them out. I hope that at least in every case the pronunciation accords with one of the variants given in LPD, even if not the first. The speakers were professional actors or voice artists engaged by the publishers, Pearson Education (Longman). Some were British, some American, as appropriate; but since the recordings were made in Harlow, Essex, the Americans were all currently living in the London area. I do not have any biographical data on them. I would estimate that all were aged between 25 and 65. As you can hear, half were men, half were women. They were all supposed to be conversant with IPA, but in practice not all could fluently read a phonetic transcription, which is one reason why I was present throughout and had to intervene from time to time. I had to allow a certain leeway to the speakers. Even though they were voice professionals, not all could control their pronunciation in the way a trained phonetician would be able to. I gave up trying to get one American speaker to cut out plosive epenthesis, e.g. dænts rather than dæns, etc. — I don’t remember the precise words in question. So the variant recorded was not in every case my first choice at this level of phonetic detail; but it was always a pronunciation covered by the printed entry, even if not the main variant. Occasionally I had to intervene to make an American actor contaminated by living in England sound more American. I remember suggesting to one such that Clinton would be better in AmE as ˈklɪntn̩ (i.e. ˈklɪ̃nʔn̩) rather than as ˈklɪntən: he agreed immediately, with a wry laugh. It would be nice to check every single sound clip for the next edition (if there is one). However, this may not prove possible. Meanwhile, thank you to those of you who have drawn occasional discrepancies to my attention. It won’t have escaped your notice that we are in the midst of celebrating the Queen’s Diamond Jubilee. I am struck by the number of commentators on British television whom I’ve noticed pronouncing diamond as ˈdaɪmənd rather than ˈdaɪəmənd (or the smoothed variants of the latter ˈdaəmənd, ˈdaːmənd). In LPD I mark ˈdaɪmənd with the sign §, indicating that as far as BrE is concerned I consider this ‘non-RP’. (In current terminology, you could say that it is ‘deprecated’.) For AmE, on the other hand, I perhaps go too far in giving only this possibility. I was wondering, has ˈdaɪmənd always been around, though presumably always considered incorrect? Or is it a recent import from AmE? Anyhow, why do Americans tend to use this pronunciation, given that it does not accord with the spelling? On consulting the OED, I find that ˈdaɪmənd, contrary to my expectation, has a considerable history in BrE. The word diamond appears to be etymologically cognate with adamant, via late Latin diamas, diamant- from the Greek ἀδάμας, ἀδάμαντ- adámas, adámant- ‘untamed, unalterable, unbreakable’. The a of the middle syllable has tended to disappear since the 16th cent., as shown by the spelling di'mond, dimond. Sheridan and other early orthoepists recognize the dissyllabic pronunciation, but most recent authorities reckon three syllables. In Shakespeare the word is more frequently a trisyllable; but it is very generally dissyllabic in Pope, Thomson, Young, Cowper, Keats, and Tennyson. So perhaps I’d better remove the § mark. And this word will be a good candidate for inclusion in the next pronunciation preference poll I conduct. The only other dia- word I can find with a similar pronunciation is diaper. In AmE it seems usually to be ˈdaɪpɚ, to rhyme with wiper, though Webster’s Collegiate adds ˈdaɪəpɚ as an ‘also’ pronunciation. Since this word is not used in modern BrE (though it is found in Shakespeare), it is difficult to say whether there is any established BrE pronunciation of it. Other candidates? As far as I know, no one says *ˈdaɪdem for diadem or *ˈdaɪgræm for diagram. Does anyone say ˈdaɪlekt for dialect? I wonder. When I was a child the range of fruit and vegetables available in the shops was very limited compared with what is on offer today. Mostly, they were just those that grow in Britain — apples, pears, raspberries, redcurrants, blackcurrants, plums, cherries, blackberries, gooseberries; carrots, peas, cabbage, marrows, onions, leeks, turnips and broad and runner beans. I think the only exotics ordinary people were familiar with were oranges, lemons, bananas and melons, and during the war and the post-war austerity even they were not to be had. It wasn’t until I was studying for my master’s in London that I first tasted a green pepper, or discovered that marrows picked early can be eaten as courgettes (AmE zucchini). I didn’t discover aubergines (AmE eggplant) until 1960, when I first visited Greece. I think I first ate a mango in 1966, when I visited Jamaica for my PhD fieldwork. In the late fifties, when I was an undergraduate in Cambridge, we sometimes had a meal in an Indian restaurant. So I had probably eaten cooked aubergine, but without knowing what it looked like raw, and under the name brinjal. We also sometimes ate in Chinese restaurants. There, for dessert, we often chose lychees. These were certainly tinned; the actual fruits wouldn’t have become available in British supermarkets until thirty or forty years later. We called this fruit a ˌlaɪˈtʃiː, or perhaps ˈlaɪtʃiː. It was written on the menu as lychee. This spelling, and the pronunciation with aɪ in the first syllable, are also what you find in Daniel Jones’s EPD. When the time came to compile LPD, I recorded this word in line with my own usage and DJ’s, with the spelling lychee and a main pron ˌlaɪˈtʃiː. I’m aware, though, that some people pronounce the first syllable with iː rather than aɪ, and some people spell it litchi. What about AmE? I note that Webster’s Collegiate prefers the spelling lychee, and gives both ˈliː- and ˈlaɪ- as possible pronunciations. The OED, however, spells the word litchi and gives only the pronunciation ˈliːtʃiː. The OED’s version corresponds well to the Linnaean name of the tree that bears the fruit, Litchi chinensis. The French name, too, is indeed litchi, and the German name Litschi. Etymology: < Chinese li-chi. First used as a generic name in P. Sonnerat Voyage aux Indes Orientales (1782) III. 255. Research shows that the Mandarin name is 荔枝, which would nowadays be written (in Pinyin) as lìzhī. So where does the prevailing, or at least widespread, pronunciation with aɪ come from? Is it just a spelling pronunciation, an English misinterpretation of the ambiguous y or i of the spelling? Not necessarily. Further research reveals the interesting fact that the Japanese name of the fruit is not the *riichi that you might expect, but reishi. Here’s part of the relevant article in the Japanese Wikipedia. The claim is that the Japanese name comes not from Mandarin but from Cantonese, where the pronunciation is lai6ji1. Assuming this to be true, here is a ready explanation of our English pronunciation ˌlaɪˈtʃiː. Our forebears must have become acquainted with the fruit, and its local name, through contacts with the Cantonese-speaking former British colony of Hong Kong. Perhaps readers versed in matters sinological could confirm this.